Cheryl Morse was 19 years old when she hitchhiked more than 700 miles from Chicago, Illinois, to Bethel, New York. She was determined to make it to the Woodstock music festival. Although Morse, now 59, no longer recalls details such as how long it took to get there or what food, if any, she ate, she still vividly remembers the music. When Crosby, Stills, Nash & Young opened their set with “Suite: Judy Blue Eyes,” she said the energy in the crowd was intoxicating. And she can still picture folk musicians Arlo Guthrie and Joan Baez performing in the rain Friday night. “It was like being totally shut off from the rest of the world for three days, with nonstop music by world-class musicians playing their hearts out … for our party,” she said. Forty years later, the Woodstock Music and Arts Fair remains a major cultural touchstone. Held in Bethel on August 15, 16 and 17, 1969, the music festival welcomed some of the biggest musicians of the era and legions of fans from across the United States. Despite the concert’s size — an estimated 400,000 people attended the festival — it seems the idea of Woodstock is bigger than the actual event was. It is remembered as a peace- and love-filled celebration, an out-of-this-world experience fueled by rock ‘n’ roll music and copious drugs. See Woodstock 40 years ago, and what the site looks like today » Like many others, it wasn’t until Morse left the festival grounds and re-entered the outside world that she began to realize Woodstock’s impact. She stopped at a local market on her way out of town and saw news coverage of the festival on television. “Until [then], I had not thought about the outside world at all,” Morse said. “That was when I slowly began to comprehend the impact the gathering was having on the country.” Woodstock, Morse explained, “came at a pivotal point in history,” when the Vietnam War and subsequent anti-war movement were in full swing. The festival, a massive event that was largely peaceful and free of riots, was considered exceptional for the time. Years later, Morse realized that Woodstock “would never be forgotten,” she said. “It took you 10 years to realize you were part of history,” said Lenny Eisenberg, who made the journey to Bethel to see Jimi Hendrix perform. “At the time, it was just another great show.” Part of the concert’s lasting power was fueled by the Oscar-winning documentary “Woodstock,” which also led to a blurred perception of the festival, Eisenberg said. “I have some distorted ideas of what happened,” he said. Still, Eisenberg recalls Hendrix’s performance that famously closed the festival on Monday morning. The aspiring photographer saved one of the three rolls of film he brought with him to document the guitarist’s set. The wait was worth it, he said. Eisenberg captured several shots of Hendrix, including one of the guitarist with his middle finger in the air, seconds after he flashed a peace sign to the audience. iReport.com: See Eisenberg’s photos “It’s really hard to pin down a best memory,” said Thomas Burke, who was 19 years old when he went to Woodstock. “The whole place was a memory.” Burke still has his Woodstock tickets along with the check his mother wrote for them. His memories from the event are fond, but fuzzy. “I remember some of the acts, but not the order or where I was when they played,” he said. He recalls seeing Richie Havens and Jefferson Airplane, and can’t forget Hendrix’s legendary performance of “The Star-Spangled Banner.” “Woodstock marked a big turning point in my life,” said Burke, who was drafted into the Army soon after returning home from the festival. “It was a fitting end to the ’60s.” “It was the experience of a lifetime. I’ve always been proud of the fact that I was there,” said Ralph Chin. He remembers the rain and mud, nonstop music, free-flowing drugs and conversations with strangers. For Chin, nothing can recapture Woodstock. “I went to a couple other festivals after Woodstock, but they fell short on the overall feeling,” he said. iReport.com: ‘The experience of a lifetime’ “Woodstock was like a big party with all your friends there, whereas the festivals afterward felt more like you were an independent entity and had no connections to anyone else.” “I think it was the ultimate spontaneous thing. 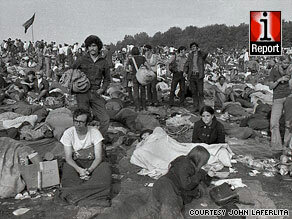 It just happened,” said John Laferlita, a photographer who attended Woodstock at 23.